I hope you enjoy the software I have written. Feel free to download and use these programs. If you would like to help support further software development, PayPal online donations are gratefully accepted. Windows Uptime Logger keeps track of how long your computer has been running with a small task bar entry. It also keeps a log, entering time stamps periodically. Very small and simple. If you are having problems with your computer shutting down unexpectedly, the logging function of this program can help discover when the shutdowns are happening. Installation: Run the installer program and follow the instructions. Lines is a board game where the object is to clear lines of five or more matching pieces in a row. Lines can be vertical, horizontal, or diagonal. A piece can only move from point A to point B if there is a clear path for the piece to follow, moving only vertically or horizontally. After each move, three new pieces fall at random on the board. When the board is full, the game is over. Game options include sound (on.off), big or little playing board, and a preview of the next three pieces (on/off). If you close the program in the middle of a game, the game will be saved automatically and resume the next time the program is run. When a game is over, if your score is high enough, your name will be saved on the top ten list. System requirements: Windows 95, 98, etc. Installation: Create a new directory in your Program Files directory called lines. Unzip the lines.zip file into this new directory. Drag the lines.exe file to your desktop to create a shortcut. That's it! 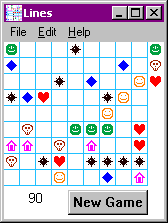 This game is based on Lines for the PalmOS by Dmitri Kornalov, but this version was written completely from scratch by Paul J. White. 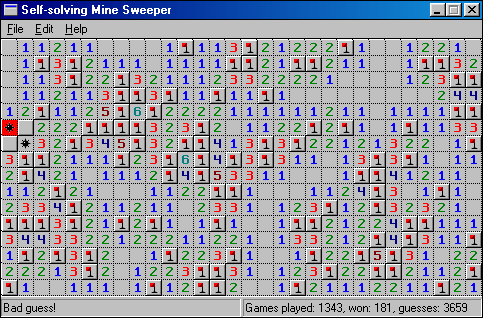 wmines is a self-solving version of the popular Windows game, Minesweeper. Sit back and let the computer do all the work! Play slow and see how its done, or switch to full speed and collect statistics on wins and losses. Let the computer play totally by logic, or allow guessing to improve the win/lose ratio. Installation: Create a new directory in your Program Files directory called wmines. Unzip the wmines.zip file into this new directory. Drag the wmines.exe file to your desktop to create a shortcut. That's it! WAV2DMX is a conversion program used to convert Windows WAV files to binary EPROM image files for use in digital drum machines, such as the Oberheim DMX or LinnDrum. System requirements: DOS 3.3 or later. Will run in a Windows DOS box. DWAV is a conversion program used to convert binary DMX EPROM image files to Windows WAV files. 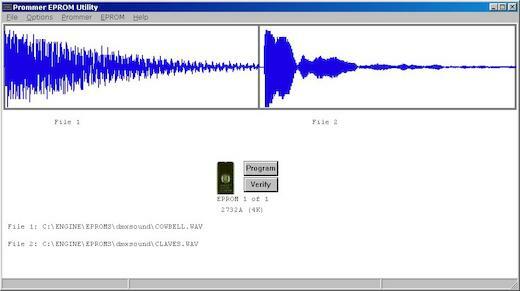 This program converts a DMX EPROM image file to a WAV audio file. The input file should be in raw binary format. Where: optional parameters are shown in [brackets]. the output filename is "input_filename.wav"
-s specifies the output sample rate in samples/second. Typical for DMX files is 22000 to 32000. -v sets verbose mode to provide more detailed information. DWAV is also available in source code format and can be compiled to run under FreeBSD (or other operating systems such as Linux). Click here to get the source code for dwav. Compilation instructions are included in the source file. DMXWAV is a Windows-based conversion program used to convert binary DMX EPROM image files to Windows WAV files and vice-versa. This is a simple Windows program with a minimal user interface. Menu options should be fairly easy to understand and self-explanatory. After a file has been converted, it will be played through your speakers. Clicking on the main window area will replay the last sound. The only edit option available is the playback sample rate. I recommend using 24000 as your standard sample rate.